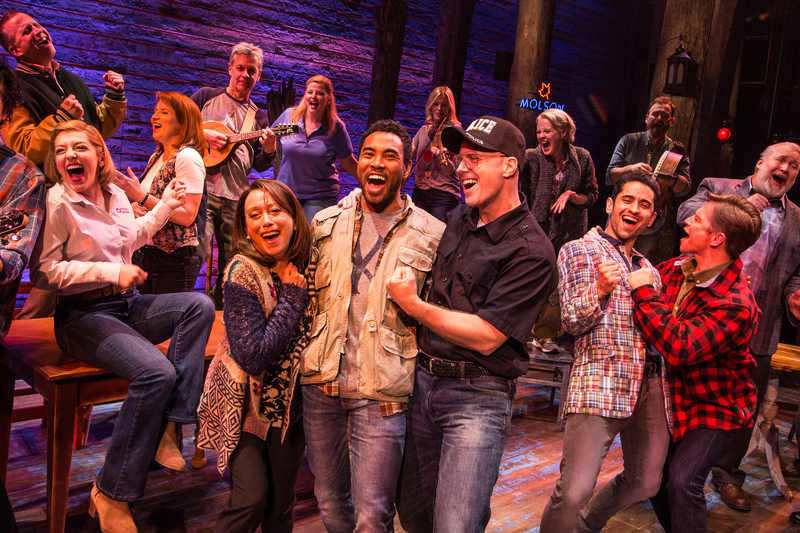 The return flight of the much-praised musical Come From Away has landed. Its rollicking warmheartedness shows it is possible to make a cheering 9/11-themed musical. The hit show plays the Royal Alexandra Theatre until September 2, 2018. As the world witnessed the 9/11 terrorist attacks on the Twin Towers and the Pentagon, thousands of international airline passengers found themselves stranded in the small town of Gander, Newfoundland, unable to get to the U.S. until American airspace reopened. Their stories, and those of the people in the community who looked after them, drive the heartfelt and sentimental musical Come From Away, a homegrown Canadian musical making it’s valiant return to Toronto. . While it’s certainly refreshing to see a new musical that hasn’t be adapted from an old film, Come From Away comes across as a tribute musical — to those in a community of 9,000 who stepped up to help, house and feed 7,000 strangers in the wake of tragedy. It tries to tell so many little stories — many of them mere moments of kindness — that there’s barely enough time to develop three-dimensional characters and substantial dramatic conflict. The strongest number, “Me and the Sky,” by a pioneering female pilot (based on real-life aviator Beverly Bass, who landed her plane in Gander that day). She’s one of the many characters inspired by actual people that members of the 12-person ensemble play, deftly shifting from, say, a gay Angeleno to a Muslim Egyptian chef with minimal costumes in the blink of an eye. Also memorable in the story is Memphis, who plays the other half of that gay Angeleno couple, who initially fear revealing their relationship to the locals and their fellow passengers, and a British man and an American woman brought together by circumstance. What a treat see a musical cast with actors of varying ages, bodies and ethnicities (especially so many older women), and directed and choreographed in a way to keep the production focused and lively.